Galls are common features on other plants as well, such as poplar and cottonwood, but they are more readily noticed on the valley oak. 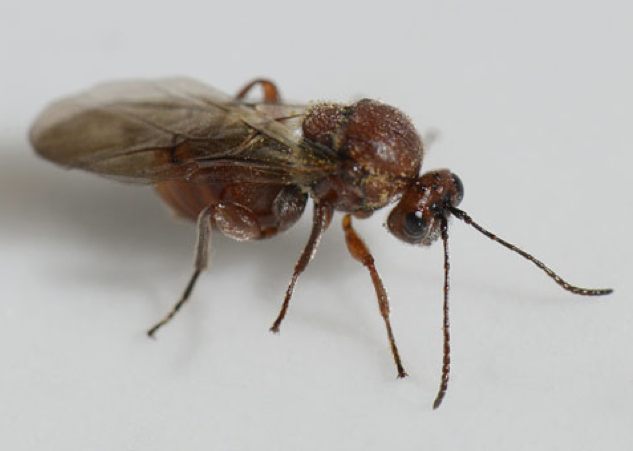 The California gall wasp (Andricus quercuscalifornicus) inserts fertilized or unfertilized eggs under the bark of oak twigs. Larvae which develop from the eggs are thought to secrete chemicals that cause the oak tree to respond defensively by growing plant tissue around the infection site, eventually forming the round growth, the oak “apple”. 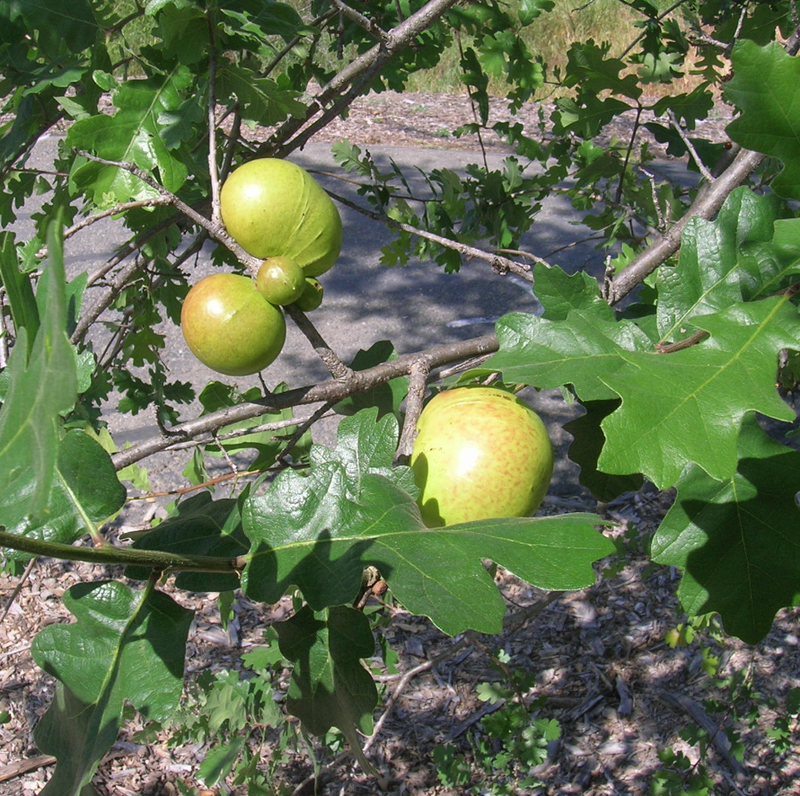 The galls are green in the spring, and turn to brown in the summer and fall. Each gall may contain one or more wasp larvae. The larvae mature and nourish themselves with the nutritive tissue of the galls, and eventually tunnel their way out of the gall as adults. In the meantime, the styrofoam-like interior of the gall functions as a cozy habitat for the developing wasps during the hot summer months. Eventually, the galls fall off, and the tree doesn’t appear to be harmed in any way. The California white oak, or valley oak, made a big impression on the Europeans who first explored this part of the country. Some sites contained hundreds or thousands of these huge trees, which commonly rose to 40-100 feet in height and 9 feet in diameter. The Franciscan missionary Narcisco Durán described the environment of the Sacramento River as “like a park, because of the verdure and luxuriance of its groves of trees”. After viewing an expanse of valley oaks in the Santa Clara Valley, the English explorer George Vancouver recorded his impression: “For about twenty miles it could only be compared to a park which had originally been closely planted with the true old English oak; the underwood, that had probably attended its early growth, had the appearance of having been cleared away and left the stately lords of the forest in complete possession of the soil which was covered with luxuriant foliage.” But the dramatic character of the valley oak was no match for the effects of “civilization” which followed the European invasion. 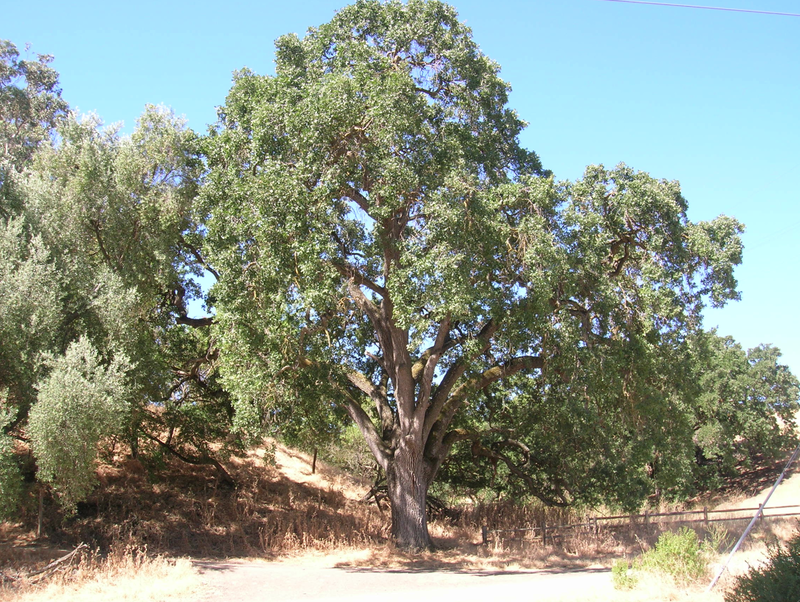 Altho the valley oak tolerates cool wet winters and hot dry summers, it is a riparian species that requires a year-round deep source of ground water. As a result, when the water table is lowered because water is pumped out to supply the needs of ever-growing human populations, the oaks are unable to reach the water they need to survive. On the other hand, when California oaks are planted in landscaping projects along with other plants that need constant summer water, such as non-native grasses, ivy, azaleas and rhododendrons, these plants develop thick mats of roots which inhibit the exchange of air and water that the native oaks are accustomed to. 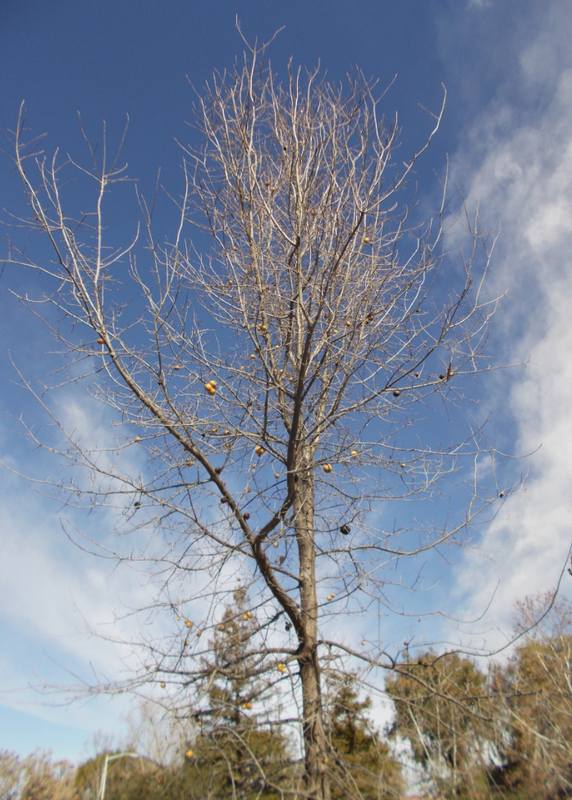 Furthermore, when oaks are watered in the summer, they are likely to die from the oak root fungus, Armillaria, which is common in the root systems of most oaks in California. Native Americans and the Valley Oaks “To native people, these regal trees marked the seeming timelessness of the earth and also the continuity of life. They were massive fixtures on the landscape bearing witness to many generations of humans.” (from Tending the Wild, by M. Kat Anderson). Acorns are rich in protein, carbohydrates and fats, as well as calcium, magnesium, phosphorus, potassium, sulfur and niacin (vitamin B3). While they are an important food source for birds and small mammals, humans can eat them too. One advantage of acorns as food is that they could be stored over the winter when food was scarce. Acorn flour and recipes using it are easily available thru the Internet. But the acorns themselves also contain tannins, which are bitter and can consti- pate the digestive system and interfere with the metabolism of protein. Different animals have evolved ways to use the nutritional value of acorns and avoid these indelicacies. One way that Native Americans made use of acorns in their diet was to chop them up, put them into porous baskets, and set the baskets in running water until the water no longer turned brown and the tannins were leached out. Then the acorns could be dried and pulverized and turned into a nutritious porridge (unappetizingly called acorn mush) or a soup. John Muir reportedly was fond of a black, hard bread that was made of acorn flour. In addition, dye for decorating baskets and clothing was made from the bark, and the tannin of acorns was used for curing animal hides. If the ground acorn meal got moldy, either by chance or intention, the penicillin-like mold could be used to treat boils, sores and inflammations. Whole acorns could also be used to make musical instruments, necklaces, toys and trade items. Another Delightfully Interesting Gall! A different wasp species, Andricus kingi, produces galls of a different and very interesting sort. The red cone gall wasp creates galls affectionately called the Hershey’s Kiss gall, because of its shape, altho it is much smaller and bright red. 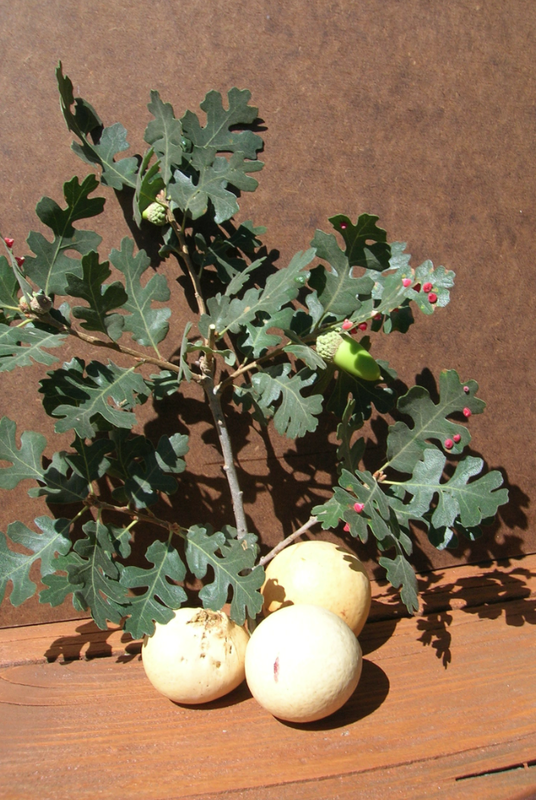 Look for this common gall on the leaves of the valley oaks. They are much smaller than oak apples, but hard to miss because of their bright color. 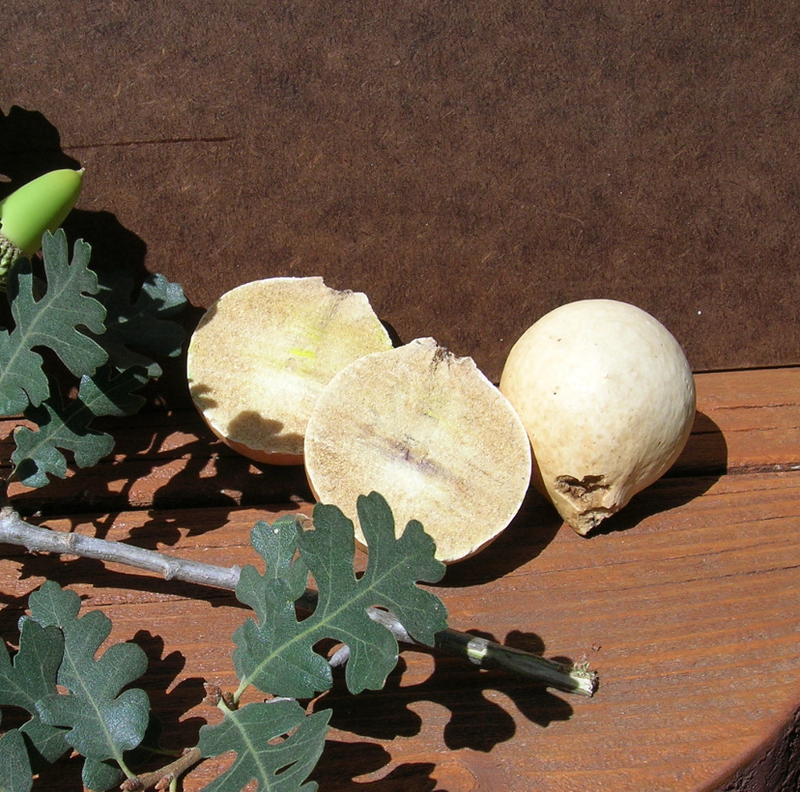 These are only two of many types of galls found on oaks and other trees. Each one has its own story. 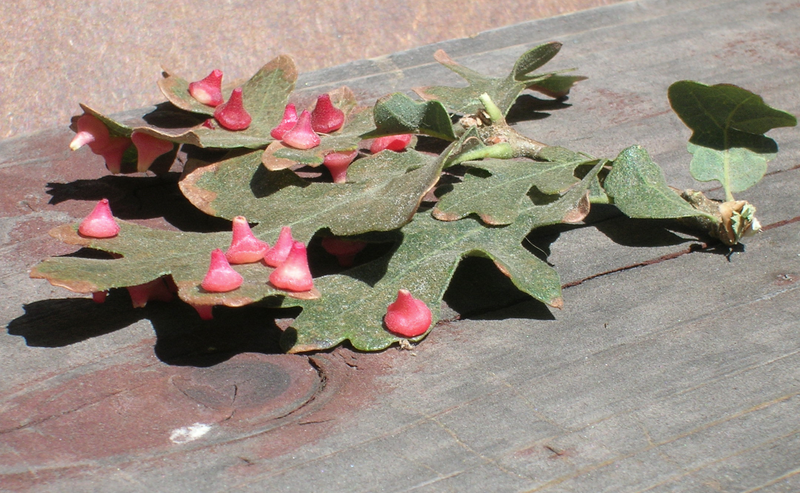 Search the Internet for yourself to learn more about these fascinating organisms, and keep your eye out for growths on California native plants that might be galls of one type or another. (Thanks to Joyce Gross of U.C. Berkeley for the use of this photo of Andricus kingii). Enjoyed this article! The Valley Oak is my favorite CA tree. I find it fascinating that there are so many kinds of galls — Mother Nature is ever inventive. A good book on galls is Field Guide to Plant Galls of California and Other Western States (2006) by Ron Russo. It is one of the California Natural History Guides published by the University of California Press.